As a former Spanish teacher, I’m always on the lookout for Spanish words and phrases. A part of me is still in “I have to tell my students about this” mode. Even in Japan! I have found many examples of a Latin presence in this part of the world. A family registering with city hall. 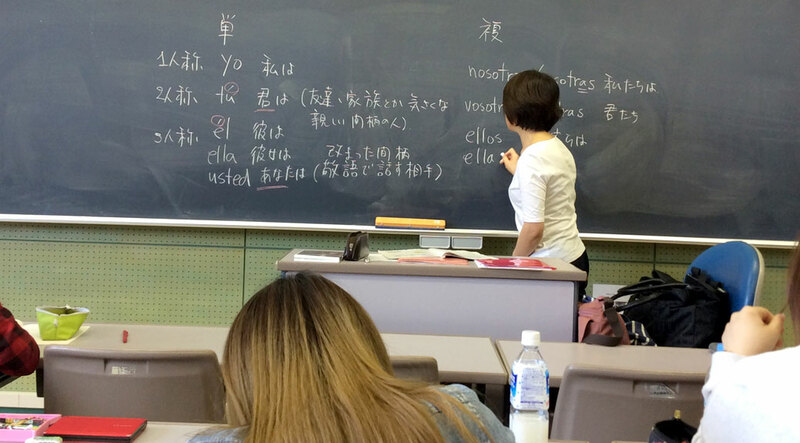 A young woman in Japanese class. Several of my students are Latino. I find these glimpses familiar, more so than overhearing Americans on a crowded street in Tokyo. Last week, I had the chance to sit in on a beginning Spanish class at the university. I can’t remember whether I was invited, or (probably more likely) I invited myself. Several students mentioned taking Spanish class and I was intrigued at an opportunity to compare it to my own experience teaching. I arrived with the two students. The seats were assigned, but a seat near them was open. While we waited for the professor, I asked one of the students why he decided to take Spanish, and after crowd sourcing for a bit, he came back with the answer that most of the students thought it was an easy class. Ha. I have heard that before. The professor walked in to a class of about 30. My students introduced me in Japanese and she conversed with me for a bit in Spanish. That was probably the first time I communicated well with a Japanese person in a foreign language. Maybe some day that language will be Japanese. If she was feeling any emotion at my surprise sit in, she didn’t show it. I admit, I tried contacting her in advance but had no luck. What bad manners! But, here we were. A flurry of conversation in Japanese. Understandably so as I taught my own students a foreign language in their native language. The students were passed out a quiz. I grabbed one. It was on beginning vocabulary—teacher, student, etc.—and how to make nouns plural based on number and gender. Ah, this I knew! I was going to ace this quiz. Except for the Japanese prompts. Afterwards, she called on students to give answers and she wrote them on the board. Students corrected their own quiz. The professor called on me to answer a question. I told her in Spanish that I couldn’t read Japanese but I thought the answer was x or y. My student leaned over and whispered that she told me I was wrong. She only wanted to hear x as the answer. How mortifying! That was a good lesson for me in how my current Japanese students probably feel. They might know the answer, but they have no idea what I’m asking. After the quiz, students orally reported their score to the teacher. Again, I quietly asked my student about that. What’s to stop a student from calling out a higher score? He said, “She trusts us and we trust her.” This would never fly in the U.S. Also, again, interesting to me my own students’ reactions when I either ask them to grade a neighboring student’s paper or I just take the paper when the quiz is over. They may be used to grading their own and doing so honestly? What a concept. More Japanese. A video on Toledo, Spain appeared. I was interested because I spent some time in Toledo in college. I could get the gist of the video because I knew the context. That was basically the theme of the class for me. Even though it was conducted in Japanese, I could understand what she was teaching. It actually helped me learn some Japanese vocabulary. It was a fun, brain teaser. My mind was fried by the end of the two hours. I thanked the teacher as I left and we had a mini conversation about Toledo. I asked her if she had ever seen it in person and then proceeded to thank her/apologize for my presence. The next day, we went to a Celebration of the Americas/Cinco de Mayo festival in Tokyo. Again, a lot of cross-lingual communication. I had fun talking to some of the food vendors asking them to describe what they were serving. There was food from Colombia, Peru and Spain. Not the most authentic in the world, but I’ll take what I can get! At some point, a young Latina translated a Japanese menu into Spanish for me so that was exciting. Yes, exciting! I got a high out of feeling understood and an exchange where both parties communicated with each other! I look forward to my next encounter with supeingo.